In 2012, the original Devil Survivor 2 was released in America for the Nintendo DS. It was a strategy RPG game from the Shin Megami Tensei family in which you fight and tame demons to defend yourself from an attack by unknown beings that want to destroy the world in a matter of days. The game was known for its fun, deep battle mechanics and engaging storyline. 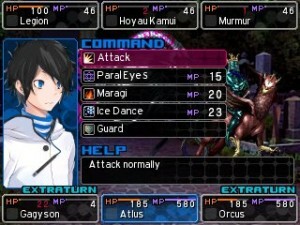 Now, 3 years later, Atlus has released an updated version called Devil Survivor 2: Record Breaker with many enhancements that make this game the definitive version of the story. In terms of gameplay, Record Breaker is divided into days, and each day into many different actions that you can take, whether talking to your friends, exploring the city or fighting demons. Each action consumes time, so you need to plan carefully what you will do since once you decide one of the actions the others are not available anymore. This leads to different endings depending on your choices, and many of them are related to the other playable characters and your relationships with them. In other words, you decide who to contact, who to help, and from there, what the outcome will be. These types of mechanics make the game really appealing to those gamers that like to squeeze out as much content of their games because the replay value here is probably the highest you can get from an strategy RPG like this one. Combat is simple, yet deep and engaging. You form a party of up to 4 characters that move in a grid-like map by taking turns and battling monsters and some humans with the help of the demons you have made a contract with. Your party levels up, along with any creatures you have used, obtaining new skills that will be essential to winning more difficult battles. In fact, levels are not as important as skills here; having a collection of high level demons is totally useless if they don’t have the correct abilities to defeat specific enemies, because skills like paralysis can make a large difference in the outcome of a battle. For those that just want to experience the game without devoting too much time to grinding, you can choose between 2 difficulties whenever you want, which makes the game as easy or difficult as needed. The game also has a nice set of DLC available that let you obtain certain skills easier, as well as increasing the amount of experience, money, etc. earned. While some gamers may find this kind of strategy just another way of getting more money out of the players, these sets are totally optional and not necessary to enjoy the experience. The story of Record Breaker is somewhat similar to the previous entry, Devil Survivor – Devil Survivor Overclocked , but they are not related; this means that if you haven’t played that game you can just jump straight into this one and you will understand the story perfectly. Record Breaker starts with 3 friends that, after downloading an app called Nicaea on their cell phones, find out how they will die, while also discovering that their city is being attacked by demons. The only way for them to survive is to fight back. Thanks to the app they can summon and contract their own demons, upgrading them to fight more powerful ones. The story progression is superb, but I have to admit that the first Devil Survivor game gave me a more powerful feeling of desperation and uncertainty. Here, the main characters have a better time than the previous team, which is odd considering the amount of deaths they have experienced in a couple of days. There are some clever twists here and there, but I can’t shake the feeling that is not as good as it could have been, especially when compared to the previous one. Graphics have been improved; character sprites are beautifully done and they move in perfect harmony with the rest of the city. Also, every enemy image has been remade to fit the higher quality resolution of the Nintendo 3DS; the only drawback is that the 3D effect is not used much because most of the action takes place in the touch screen, but you’ll see it in action when you fuse demons and other minor moments. The soundtrack has also been revamped, with some nice remixes of the Nintendo DS version that fit the mood of the game. And probably the best aspect of the game is that now it is 99% voice acted, which is a welcome addition since the quality of the actors is quite impressive. Daichi in particular has some really fun lines that make the game a joy to listen to, and those that have already played the previous version will notice that the script has been re-translated for this edition. In a refreshing twist on the usual teen protagonist and drama angst, Strange Journey focuses on a militaristic science fiction story. A massive solid black quantum singularity appears in Antarctica and begins to slowly spread across the globe. More could have been done to clarify the game's myriad battle systems and spruce up the creaky visual engine behind it for less experienced players, most of whom would probably be immediately baffled and turned off by this dated work. Even when armed only with its age and a modern translation, though, Soul Hackers' great storytelling and infectious dark spirit make it a forty-hour-plus proposition that long-time JRPG fans should consider.